In iconography, many Vajrayana deities are seen surrounded by flames. This can represent ‘wisdom’ and/or be a means of purification or healing. For example, a mantra may be visualised rotating around the deity’s ‘seed’ syllable, with the letters becoming a circle of fire – sent to heal the sick person. Alternatively, a spark and growing flame can be visualised starting at the part of the body affected, burning away the impurity. In physical actions there can also be healing with fire such as moxibustion, and we know of the action of fire in cauterising a wound. Another physical aspect of fire in ritual is to eliminate impurities by throwing the substance which represents them (say black sesame seeds) into the mouth of the fire deity. Fire is also ritually used as an offering, usually in the form of a candle, lamp or incense offering. Whenever a flame is present, fire can also be an offering of light, flame as light being shown in the wonderfully colourful Hindu festival of Diwali. In Shamanic terms, Fire is one of the 5 Elements (Space, Air, Water, Fire, Earth). Fire is an aspect of initiation and this may be in the form of a fever which purifies the Shaman for his future role. Some shamanic groups have a different set of Elements, but Fire is always present, sometimes as one with the Sun. Smiths working metal in the fiery forge have historically also been perceived as engaged in sacred work ,especially when crafting ritual implements or weapons. In other forms, the crucible as the vessel of creation is highly symbolic. In terms of renewal we have the phoenix arising from the ashes, and the Garuda as the very embodiment of the power of the Fire Element in all its aspects. Fire may also be used for divination – usually from the flames, but sometimes the embers or ashes. This can even be accomplished on a small scale with a candle or lamp (oil or butter lamp). Sometimes this is used in combination with a melong/toli mirror through which the reflection of the flames is viewed. As well as purification, fire can be seen as protective. The flame, smoke and ashes being used to protect through rituals such as the Pagan festival of Beltane or through ‘smudging’ or burning incense to purify and protect a place, such as a home. Fire is also a part of many funerary rites, where cremation and purification are sometimes unified. It may also partly be protective, for example to prevent body parts being used in black magic. Fire Rituals, in summary, can be performed for purification, healing, or as protection, including offerings to deities and spirits. This may be related to cycles of the moon, allied to the sun, or linked with the specific place as well as the time of month, season or year. The number of fire rituals in each religion and country is too numerous to mention. One example is that of Fukuoka Prefecture on Kyushu Island, where at Daizenji Tamataregu Shrine’s “Oniyo” Fire Festival is held as a ceremony to drive away evil spirits. It has been practiced for 1,600 years. Mnay cultures will have a similar festival related to ancestors or ghosts, or other spirits. Agni (Sanskrit: अग्नि) is a Hindu deity, one of the most important of the Vedic gods. He is the god of fire and the acceptor of sacrifices. The sacrifices made to Agni go to the deities because Agni is a messenger from and to the other gods. He is ever-young, because the fire is re-lit every day, and also immortal. Agni, the Vedic god of fire, has two heads, one marks immortality and the other marks an unknown symbol of life. Agni has made the transition into the Hindu pantheon of gods, without losing his importance. 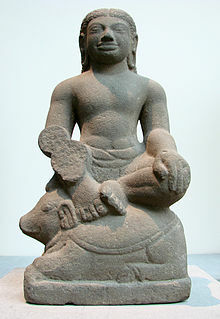 With Varuna and Indra he is one of the supreme gods in the Rigveda. The link between heaven and earth, the deities and the humans, he is associated with Vedic sacrifice, taking offerings to the other world in his fire. In Hinduism, his vehicle is the ram. The word agni is Sanskrit for “fire” (noun), cognate with Latin ignis (the root of English ignite), Russian огонь (ogon), Polish “ogień”, Serbo-Croatianoganj, and Lithuanian ugnis—all with the meaning “fire”, with the reconstructed Proto-Indo-European root being h₁égni-. Agni has three forms: fire, lightning and the Sun. In Hindu scriptures, Agni is the God of Fire, and is present in many phases of life such as honouring of a birth (diva lamp), birthdays (birthday candles on a cake), prayers (diva lamp), weddings (Yagna where the bride and groom circle 7 times) and death (cremation). अग्नि॒म् ई॑ळे पुरो॒हि॑तं यज्ञ॒स्य॑ देव॒म् ऋत्वि॒ज॑म् । होता॑रं रत्नधा॒त॑मम् ॥ agním īḷe puróhitaṃ / yajñásya devám ṛtvíjam / hótāraṃ ratnadhâtamam Agni I laud, the high priest, god, minister of sacrifice, The invoker, lavishest of wealth. He is the supreme director of religious ceremonies and duties, and figures as messenger between mortals and gods. 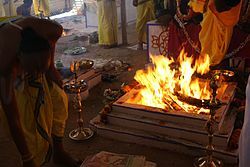 Vedic rituals all involve Agni, for example the elaborate Agnicayana, that is, the piling of the fire altar, the Agnihotra, viz., offering to Agni. The Rigveda often says that Agni arises from water or dwells in the waters. He may have originally been the same as Apam Napat, who is also sometimes described as fire arising from water which in a natural explanation may have referred to flames from natural gas or oil seepages surfacing through water, or as the seven rays or bands of light of a rainbow. Other Rigvedic names, epithets or aspects of Agni includeMatarishvan, Jatavedas, or Bharata. 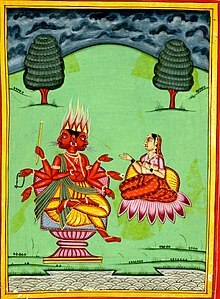 Agni is a deva, second only to Indra in the power and importance attributed to him in Vedic mythology, with 218 out of 1,028 hymns of the Rigveda dedicated to him. He is Indra‘s twin, and therefore a son ofDyaus Pita and Prthivi. However, he is also said to have two mothers (the two parts of the firedrill used to start the fire), and ten servant maids (the fingers of the man who is lighting the fire) or as the twice-born. He is one of the Guardians of the directions, representing the southeast. Agni, god of fire acts as the divine model for the sacrificial priest. He is the messenger who carries the oblation from humans to the gods, bringing the gods to sacrifice, and interceding between gods and humans (RgV.1.26.3). When Agni is pleased, the gods are generous. Agni represents the cultivated, cooked and cultured aspects of Vedic ritual. Together with Soma, Agni is invoked in the Rig Veda more than any other gods. Agni with his consort Svaha. 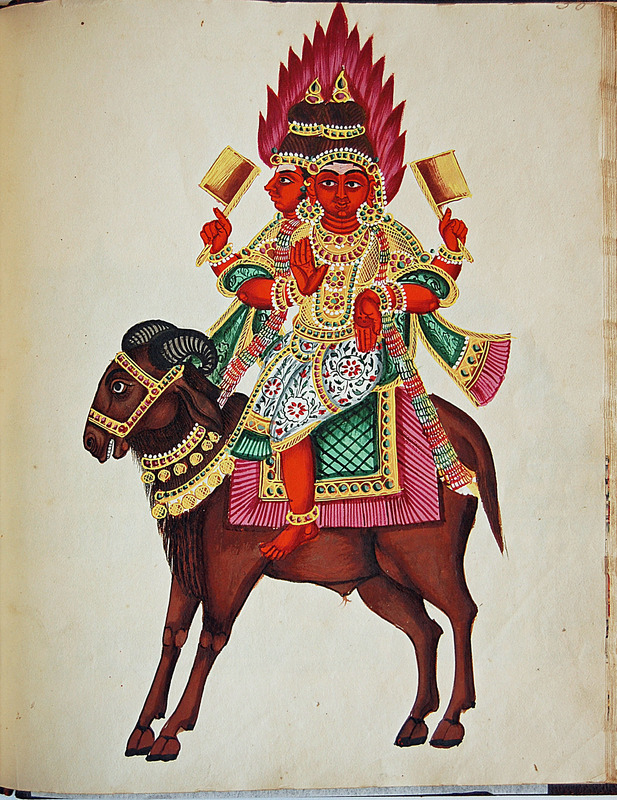 In Hindu scriptures, Agni is depicted with two or seven hands, two heads and three legs. He has seven fiery tongues with which he licks sacrificial butter. He rides a ram or in a chariot harnessed by fiery horses. Agni is represented as red and two-faced, suggesting both his destructive and beneficent qualities, and with black eyes and hair, three legs and seven arms. He rides a ram, or a chariot pulled by goats or, more rarely, parrots. Seven rays of light emanate from his body. One of his names isSaptajihva, “having seven tongues”. Another one of his epithets is Abhimani (from Sanskrit: abhi towards + the verbal root man to think, reflect upon) meaning dignified, proud; longing for, thinking. Agni is the eldest son of Brahma. In Visnu Purana, Agni (Abhimani) the fire god is said to have sprung from the mouth of the Virat purusha, the Cosmic Man. His wife isSvaha. Abhimani had three sons of surpassing brilliancy: Pavaka, Pavamana, and Suchi, the personifications of the three fires that produced our earth and humanity (VP 1:10). All these three names indicate purity. Abhimanin, his three sons, and their 45 sons constitute the mystic 49 fires of the Puranas and theosophy. (cf Agni Purana. )Agneya or Aagneya is the Hindu Goddess of Fire and the daughter of Agni. His three sons, according to the Vayu Purana, stand for three different aspects of Agni (fire): Pavaka is the electric fire, Pavamana the fire produced by friction, and Suchi the solar fire. Interpreted on the cosmic and human planes, these three fires are “Spirit, Soul, and Body, the three great Root groups, with their four additional divisions” (SD 2:247). They are said to have been cursed by the sage Vasishtha to be born again and again (cf BP 4:24,4; SD 2:247–8). “Every fire has a distinct function and meaning in the worlds of the physical and the spiritual. It has, moreover, in its essential nature a corresponding relation to one of the human psychic faculties, besides its well determined chemical and physical potencies when coming in contact with the terrestrially differentiated matter” (SD 1:521). Agni is also an important entity in Ayurveda. It is considered to be the one which is responsible for the sustenance of life. Agni helps in the various physiological functions of the body. In some Hindu symbolism, Agni’s parents are said to be the two components of the firedrill used to start the fire, and when young he was said to be cared for by ten servants, which represent the fingers of the man who is starting the fire. Agni is the name of India’s first long-range strategic missile capable of nuclear weapons delivery, becoming only the fourth country to have this combined technology (after the Soviet Union/Russia, the United States and China). The Agni-V was successfully test launched on April 19, 2012. In Newar, Tibetan and Japanese Buddhism, he is a lokapāla guarding the Southeast. In the Tibetan text Jigten lugs kyi bstan bcos it says “Make your hearth in the southeast corner of the house, which is the quarter of Agni”. He also plays a central role in most Buddhist homa fire-puja rites. A typical praise to Agni starts “Son of Brahma, Lord of the World, King of fire gods empowered by Takki, Whose supreme wisdom burns all delusion […]” In Mikkyō tradition Agni is known as Katen(火天). In the Multiplayer online battle arena, SMITE, Agni is a playable god. Agni is a ranged caster and is nicknamed the God of Fire . ^ Bowker, John (1997). World Religions. New York: DK Publishing, Inc.
^ Perrott, Michael; Tuluku, Sharpa (1987). A Manual of Ritual Fire Offerings. Library of Tibetan Works and Archives. ISBN 81-85102-66-X p. 20. Indo-Parthian stone palette, illustrating a fire worship, possibly of a Zoroastriannature. Agni the Hindu deity of fire, has a very prominent place among Rigvedic deities. Worship or deification of fire (also pyrodulia, pyrolatry or pyrolatria) is known from various religions. Fire has been an important part of human culture since theLower Paleolithic. The earliest known traces of controlled fire were found at Gesher Benot Ya‘aqov, Israel and dated to an age of 790,000 years, and religious or animist notions connected to fire must be assumed to reach back to such early pre-Homo sapiens times. In the animal kingdom, the controlled use of fire is restricted to human species. In Indo-European languages, there were two concepts regarding fire: that of an animate type called *egni- (cf. English ignite from Latin ignis, and Russian ogon), and an inanimate type *paewr- (cf. English – fire, Greek pyr, Sanskrit pu). A similar distinction existed for water. Archaeologically, the earliest evidence for Indo-Iranian fire worship is found at the transition from the Sintashta-Petrovka to the Fedorovo culture around 1500 BC, together with first evidence of cremation. While cremation became ubiquitous in Hinduism, it came to be disavowed in Zoroastrianism. However, even earlier evidences of vedic fire altars have been found at the Indus Valley sites of Kalibangan and Lothal, giving rise to speculations towards earlier assumed the geographical location of the early Indo-Iranians. Although the term “fire-worshippers” is primarily associated with Zoroastrians, the idea that Zoroastrians worship fire is originally from anti-Zoroastrian polemic. Instead, fire — even in a Fire temple (the Zoroastrian terms are more prosaic and simply mean “house of fire”) — is considered to be an agent of purity and as a symbol of righteousness and truth. In the present day this is explained to be because fire burns ever-upwards and cannot itself be polluted. Nonetheless, Sadeh andChaharshanbe Suri are both fire-related festivals celebrated throughout Greater Iran and date back to when Zoroastrianism was still the predominant religion of the region. In Vedic disciplines of Hinduism, fire is a central element in the Yajna ceremony, with Agni, “fire”, playing the role as mediator between the worshipper and the other gods. Related concepts are the Agnihotra ritual, the invocation of the healing properties of fire; the Agnicayana ritual, which is the building of a fire altar to Agni; andAgnistoma, which is one of the seven Somayajnas. In the Vaishnav branch of Hinduism, Agni or Fire is considered the tongue of the Supreme Lord Narayana, hence all the sacrifices done even to any demigod ultimately is a sacrifice to the Supreme Lord Narayana. Fire worship in Graeco-Roman tradition had two separate forms: fire of the hearth and fire of the forge. Hearth worship was maintained in Rome by the Vestal Virgins, who served the goddess Vesta, protector of the home, who had a sacred flame as the symbol of her presence in the city (cf. Sacred fire of Vesta). The Greek equivalent of the goddess was Hestia, whose worship is less well attested. The fire of the forge was associated with the Greek god Hephaestus and the Roman equivalent Vulcan. These two seem to have served both as craft-guild patrons and as protectors against accidental fires in cities. Also associated with fire is the titanic god Prometheus, who stole fire for humans from the gods. Most forms of worship in Graeco-Roman religion involved either cooking or burning completely an animal on a fire made on an altar in front of a temple (see hecatomb). Celtic mythology had Belenus, whose name, “shining one”, associated him with fire. In Slavic mythology, Svarog, meaning “bright and clear”, was the spirit of fire. The best known and dramatic among numerous Slavic Pagan fire rituals is the jumping over the bonfire on the Ivan Kupala Day. Fire is an element of theophany in the Hebrew Bible‘s burning bush, pillar of fire, and the Eternal flame of the Menorah. The highest form of sacrifice is the Korban Olah, performed twice-daily, which is an animal sacrifice completely consumed by fire. In the New Testament, the Holy Spirit is manifested as “tongues of flame”. Fire continues to be a part of many human religions and cultures. For example, it is used in cremation and bonfires; candles are used in various religious ceremonies; eternal flames are used to remind of notable occasions; and the Olympic Flame burns for the duration of the games. Holy fire in the Church of the Holy Sepulchre in Jerusalem has been consecutively documented since 1106 A.D. It is considered by many to be the longest-attested annual miracle in the Christian world. ^ Madhulika Sharma (2002). Fire Worship in Ancient India. Jaipur Publication Scheme. ISBN 81-86782-57-5. This page was last modified on 24 May 2013 at 11:49.